Mangroves: What are they and why are they so important? Nature preservation. It requires our attention because many of the world’s species are becoming endangered. Mangroves, shrub-like trees that grow in salt water marshes and wetlands of subtropical and tropical regions, are one of them. Mangrove forests have been devastated by acts of nature and especially by man’s land development and industry expansion. 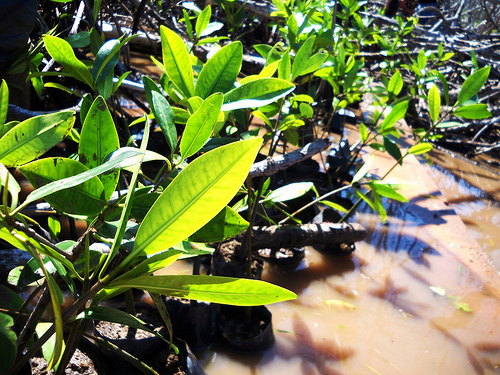 Flourishing mangrove forests are essential to healthy marine ecology. Mangroves provide food, protection, shelter, and nesting places for marine life, reptiles, and birds. They stabilize lowlands with root systems that prevent shoreline erosion and protect highlands with dense foliage that shields land from wind, storms, waves, and floods. They also act as a filter that traps sediment, keeping water clear, which protects the coral reefs and seagrass beds. Preserving the natural environment is also essential for maintaining healthy ecosystems that provide all people with food, clean water, and fuel. You can help with environmental preservation by supporting Hacienda Tres Rios Resort, Spa & Nature Park‘s initiative for donating mangrove trees to the reforestation program in Cancun, Mexico. 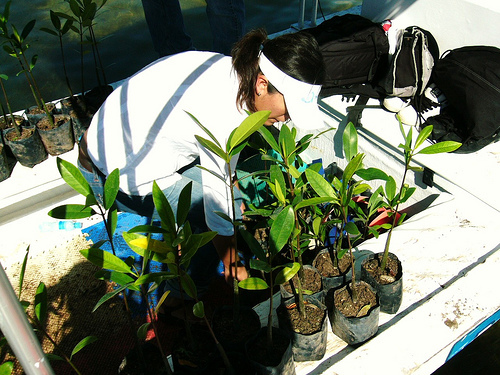 This simple yet profound action can support nature conservation: For every new person who chooses to “Like” the Hacienda Tres Rios Resort Facebook page, the resort will donate one mangrove tree beginning today (October 7, 2010). This past February, the eco friendly resort donated 3,000 red mangrove trees (of over 90% needed) to reforest Nichupte Lagoon’s mangrove forests devastated by Hurricane Wilma in 2005. Hacienda Tres Rios Resort currently has 3,385 “Likes” on its Facebook page. By increasing this number to 6,385 with the “1 Like = 1 Mangrove” campaign, it aims to donate an additional 3,000 mangrove trees to Cancun’s reforestation program. Help us reach this goal by asking your family, friends, colleagues, and acquaintances to “Like” the Hacienda Tres Rios Facebook page. It’s easy. Just use the “Suggest to Friends” link under the Facebook page photo in the upper left-hand corner.